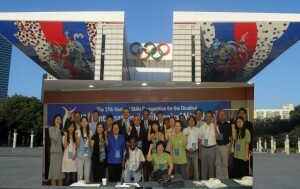 In preparation for the 2011 International Abilympics (IA) that will be held in Seoul, Korea, the National Council on Disability Affairs (NCDA) has participated in the 4-day workshop alongside delegates from other eight countries. ABILYMPICS, coined from olympics of abilities of persons with disabilities (PWDs), is a global work skills competition held every four years in various host countries. Representatives of different countries who will participate in the 2011m International Abilympics in Seoul, Korea including Philippine delegation composed of Mrs. Nelia R. De Jesus and Mrs. Cynthia B. Barriga, (third and fourth from right, respectively) join other participants from participating countries for a photo opportunity. NCDA representatives Mrs. Nelia de Jesus and Mrs. Cynthia Barriga were fielded to observe best practices on employment of persons with disabilities and build network with fellow member countries of the International Abilympics Federation (IAF). IAF is the umbrella organization of the world event. 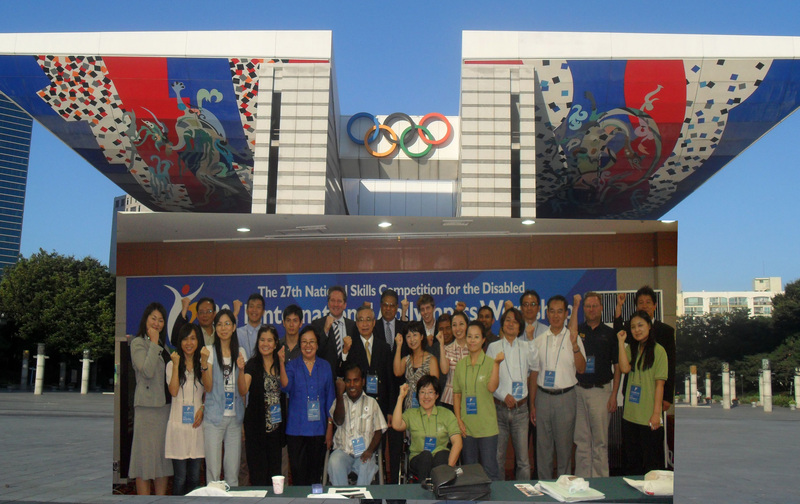 The workshop also gave the delegates a glimpse of the 27th National Abilympics in Korea held at the Olympic Park in Seoul. They observed events on Cake Decoration, Bicycle Repair, Painting and Techno Fair of the latest assistive technology on disability. The workshop included a visit to SAMSUNG facility including other related institute and industrial work places, and the briefing for the 8th International Abilympics in 2011 also thereof. In preparation for the countryâ€™s participation to these global skills Olympics, the NCDA collaborates with the Technical Education and Skills Development Authority in the screening/selection of prospective participants who will compose the Philippine delegation. Regional screening will be undertaken to select the qualified competitors in their respective trade areas. Â Abilympics Philippines, Inc. (API) which is the lead non-government organization in this undertaking is collaborating with the NCDA, TESDA and other government agencies to select a pool of contestants who will be fielded for the 2011 event. The Philippines has fielded PWD contestants to compete in various fields that were held in Hongkong in 1991; Perth, Australia in 1995; Prague, Czech Republic in 2000; New Delhi, India in 2003; and in Shizuoko, Japan in 2007 in previous international Abilympics competitions. The participation of Filipinos with disabilities in these international skills competitions have brought prestige and honor to the country especially when the Philippine team ranked eight and sixth in the 2000 and 2003 International Abilympics, respectively. The International Abilympics aims to promote work excellence and work opportunities for persons with disabilities and foster international friendship. I am a physically challenged person. I was going through google.com’s information on persons living with disabilities, and I found this news (2011 International Abilympics (IA) that will be held in Seoul, Korea), and I became interested in it. Also, I read lots of activities of the National Council on Disability Affairs and its various partner and affilate organisations, and I must say at this juncture that, they are doing a good job. However, what does it take to attend the 2011 International Abilympics (IA) that will be held in Seoul, Korea? I await your urgent response. Please visit the official IA 2011 website for information on how to register. Thanks for your reply. However, I beg of you, please send me the actual link that will enable me to register for the 2011 International Abilympics (IA) that will be held in Seoul, Korea. I have tried to get the link from the site, but I could not. Thanks for your understanding as I await your urgent response.